Facebook Marketplace For The Win! Okay ladies…put your hair in a pony tail, throw on your comfy fat pants (i.e. sweatpants), and unhook your bra (we all know that is the best part of every day! )…because today’s post is far from glamorous. …for a DIY that isn’t very pretty. I figured we’ve had a lot of glamorous posts lately (like yesterday’s patio reveal…and Bridget’s gorgeous office last week!) so today let’s dish on something a little less beautiful. Okay, I’m not exactly talking up this DIY project. I swear that it is actually pretty awesome, super easy, and it’s a project that I recommend each and every one of you tackle as soon as possible! 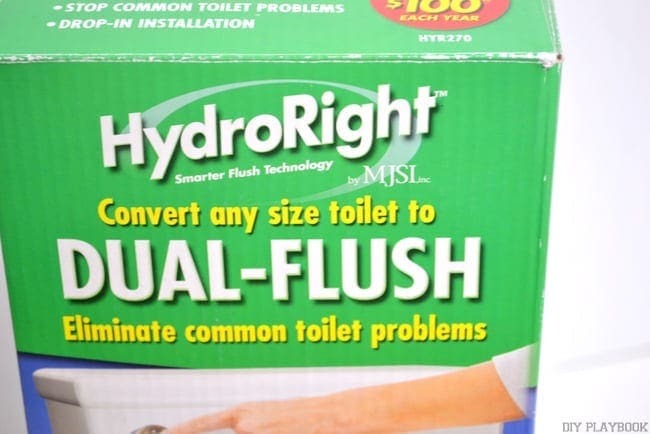 Today, I’m going to show you how to install a dual flush kit. 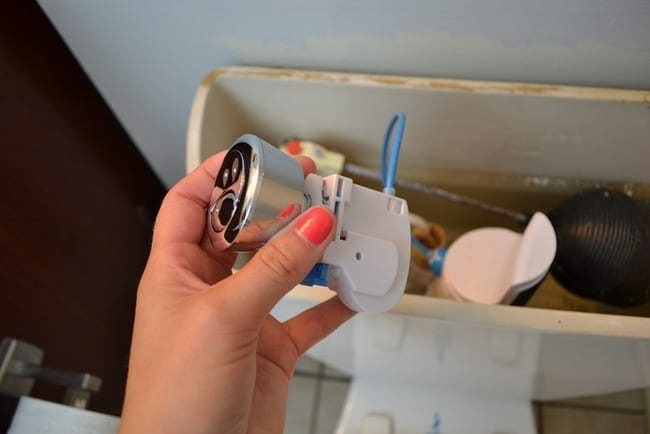 So now many of you may be scratching your heads thinking…what is a dual flush kit? 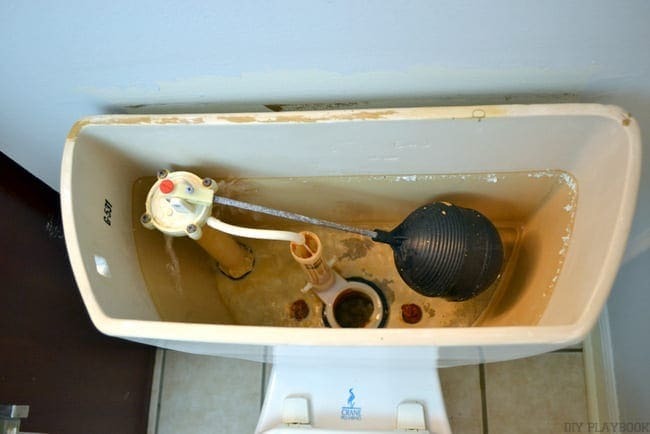 Well, it’s a small device that can be installed into most existing toilets to reduce the amount of water it uses each time you flush. 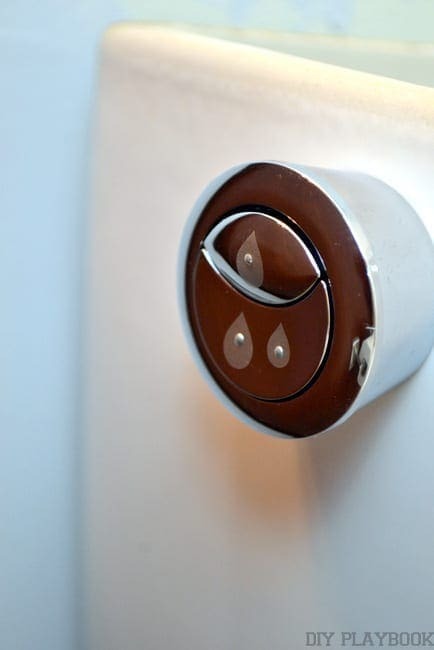 To cut to the chase…you hit one button to flush “liquid” waste, and another button to flush ummmm….”#2″. See I told you this isn’t the prettiest project we’ve ever tackled. But, I’m not gonna lie. 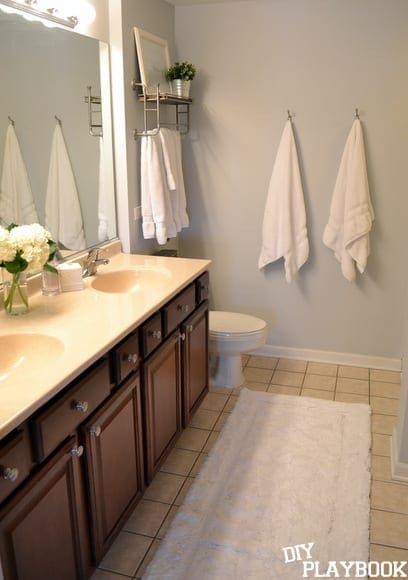 That’s not the #1 reason why we installed a dual flush in our master bathroom. Sure, I believe in becoming more energy-efficient. And who doesn’t want to save money on their water bill? But the real reason we installed this little guy? Our toilet was driving me bonkers! 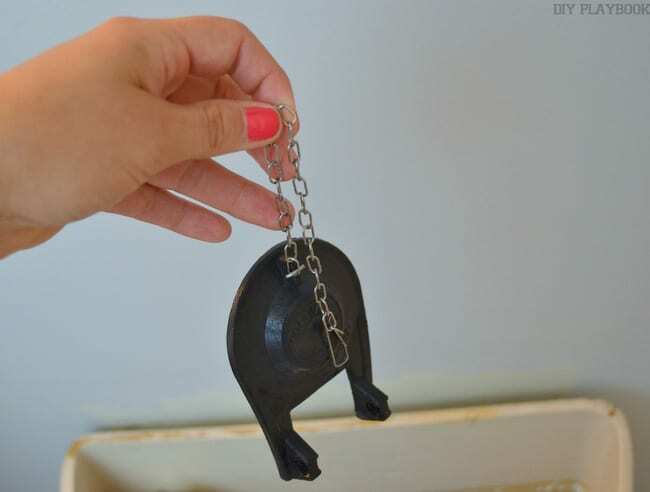 The handle and flapper were so old that it was constantly breaking. Often times I would come into the bathroom to find that the toilet has been running all day long. I’d open the back of the tank, push the flapper down, and hope that it would cooperate. Finn and I kept saying we should call the landlord to come fix it, but it just never happened. Sometimes when you’re a renter you hate bugging your landlord every time something small breaks, especially when you know it would just be a heck of a lot faster to fix it yourself. So on a random weekday night, I finally decided to end my hateful relationship with our toilet once and for all. 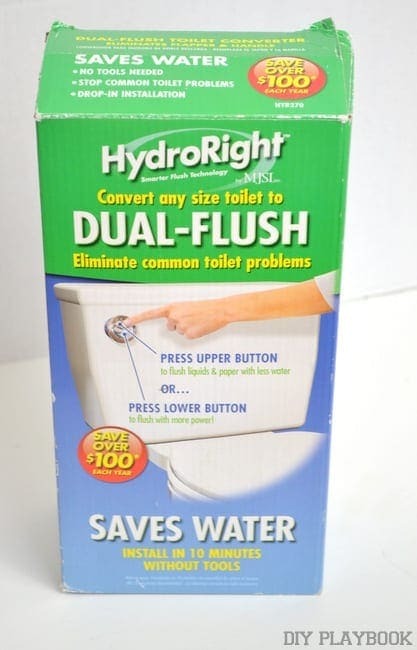 I found this dual flush kit for $20 at Home Depot. 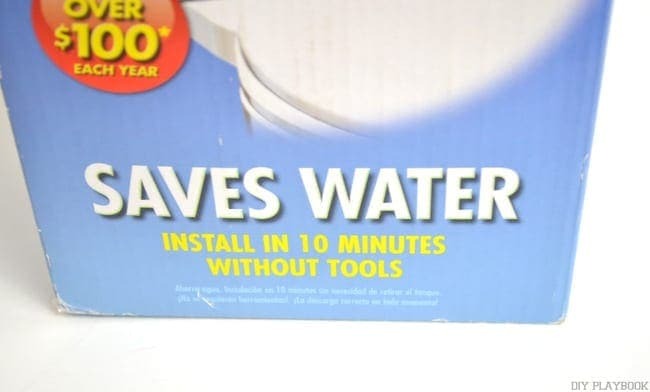 It looked fairly simple to install, and my confidence grew when I saw the words “Install in 10 minutes without tools.” No tools? Yes please! Here is the contraption. It may look complicated and scary…but it really isn’t. 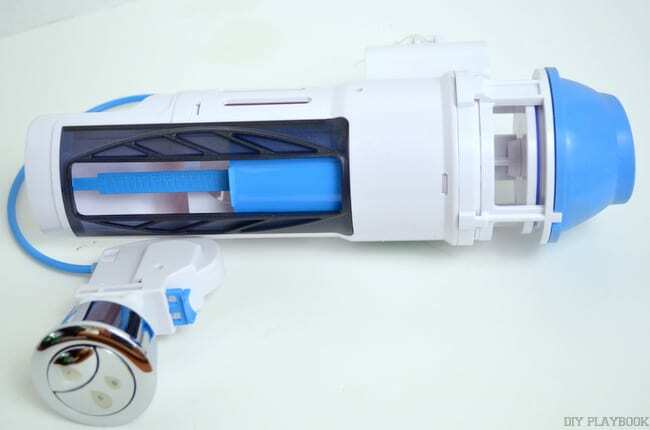 The blue part regulates how much water is let out when you flush. You can easily adjust the level right on there. Here is the new handle. You’ll see the top button is for #1, and bottom button is for #2. It’s actually looks pretty sleek and futuristic-looking if you ask me. Okay, so let’s get going on this 10 minute installation. I first opened up the back of my tank and took a looksie around. Not exactly the most gorgeous picture we’ve ever shown on DIY Playbook. But hey, it’s a toilet tank. 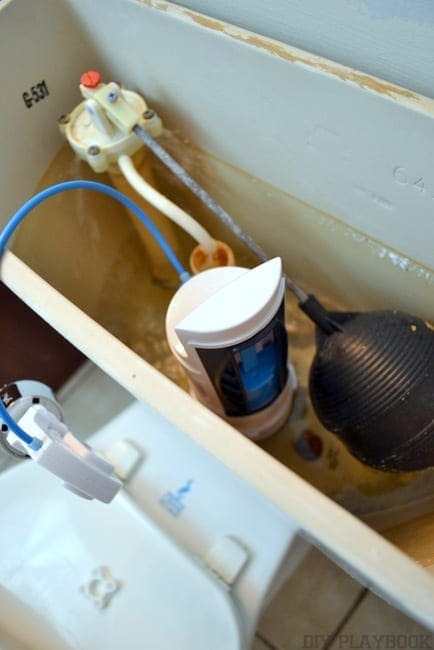 The first step is optional…and that is to turn off your water supply and drain the back tank. I decided to forego this optional step. Consider me a lazy do-it-yourselfer. Then it was time to remove all of the old stuff in the tank….the flapper and the handle. This required no tools for me. It was just a matter of unhooking a few parts. The yucky handle and flapper were removed in 2 minutes flat. Now I had an empty toilet that was ready for new parts. To install, I first slid the bottom part of the kit onto the area where the old flapper was located. The kit even came with a zip tie to hold this piece into place, so I tightened it up nicely. 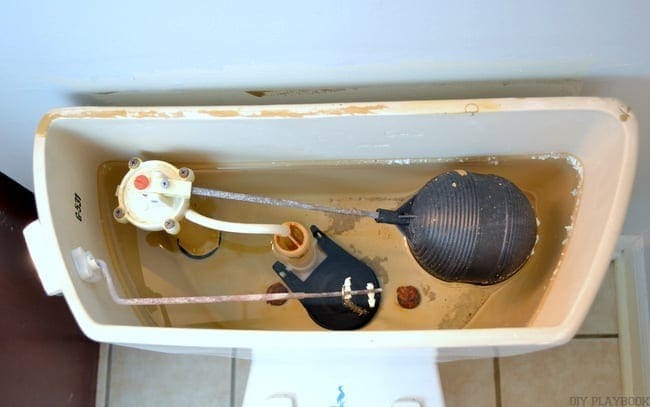 Then I attached the top part of the dual-flush with a simple drop and twist motion. Next up, installing the new handle. Again, no tools required for this step. You simply push in the blue button and the handle pops off. 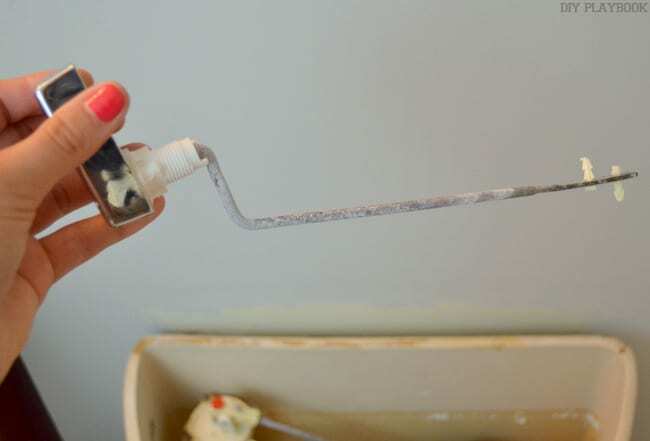 Then just fish it through the hole in the side of the toilet and tighten by hand. That’s it! Seriously…how easy was that? Before putting the lid back on the tank I tried the buttons a couple of times. Thankfully it was a success. Now it’s your turn. 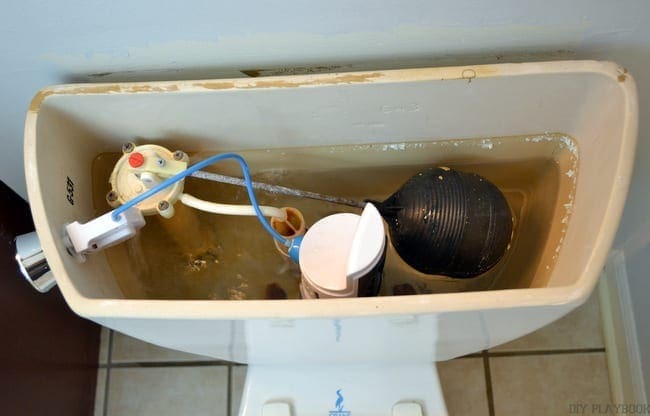 Go and buy this $20 kit and install it on your home’s toilet. I promise you’ll notice a different in your next water bill.